We are one-stop label printers and label makers, offering total label solutions, and we are able to meet a wide range of different client needs. So if you require 1,000 per month (100 x 10 different products, for example), or 25,000 colour labels in one print, plus design and layout help - we will be extremely competitive. We print digital (CMYK) and are very flexible in our approach. 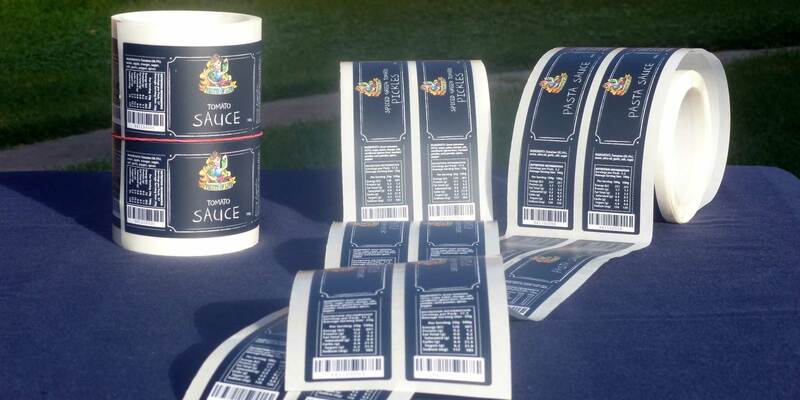 And unlike most major printers, we provide a whole range of other support to develop a professional and affordable range of labels to meet your specific needs. Most of our clients are small and specialised - often family-run businesses, handmade, organic, and boutique food, wine, and olive oil producers, stallholders at farmers markets, health and lifestyle product makers, and sole traders across many industries. Many of these clients have had limited experience dealing with the development, design, printing and production of labels for their products. We take the hassle and stress out your label project - providing effective support at all stages from initial ideas through to finished products. Some clients (often graphic design houses and other printers) approach us with print-ready artwork ready to go ... but 95% of our clients do not. They appreciate the level and quality of design support - services not offered by most printers who require print-ready artwork. Our services are provided at a low up-front cost, and in the end, it will always pay off. The right label for the right situation - economical, accurate, professional, and repeatable far into the future. We work with you to develop the best set of solutions for your labelling needs - and we do it in a very relaxed and friendly manner. We pride ourselves on developing close working relationships, and this means we have a large percentage of repeat clients, who rely on our service, advice, and low prices. We pride ourselves on the quality of our service and our relationships with our clients.